Our Buda roofing team was founded on one basic principal: focus on helping people solve their problems. This sounds elementary. But if it is, why do so many homeowners have so many bad contractor experiences? Buying a contracting service is not like buying a finished product. A finished product like a car or a computer is usually constructed in a factory somewhere. A construction project gets constructed on your home, or in your home. Since homeowners would not be buying a contracting service if they were contractors for a living it is safe to assume that they are relying on the contractor to be The Professional. What most homeowners do not consider, is that there is no formal training for most contracting trades. No training for design, specifications, installation, or most importantly how to run a business. A recent survey showed that only 55% of people who get roofing work done would refer their roofing contractor. So what can you do? 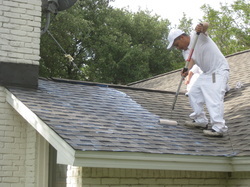 Below is a list of criteria recommended by the National Roofing Contractors association. All roofing contractors are not alike, and NRCA recommends that you pre-qualify roofing contractors to get the job done right the first time. Check for a permanent place of business, telephone number, tax Id number, and a business license. Insist on seeing copies of the contractor's liability insurance coverage and workers' compensation certificates. Make sure the coverage is in effect through the entire job.